Week 8 – Snow, Glorious Snow! 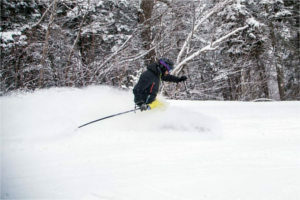 Mike Chait at Smugglers’ Notch Resort in the Stowe-Smugglers’ Notch region reports, “Despite Thursday and Friday’s wild weather, Smugglers’ recovered rather well with 6-8” falling by midday Saturday. We are grateful that the snow started out wet and slushy, helping to bond with the base surface. As the storm progressed, it dried out considerably. 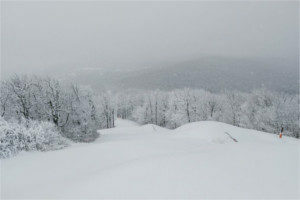 While the mountain’s base is not nearly as deep as it was this time last week, we’re pleased with the outcome overall! Folks are still going in the woods, albeit cautiously, but it shouldn’t take much to bring conditions back to normal! 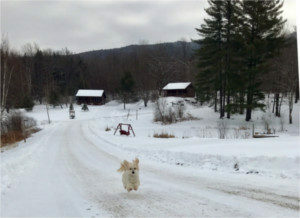 Jessica, from Sterling Ridge Resort in Jeffersonville, only 4 miles from Smugglers’ Notch, remarks, “No day like a snow day at Sterling Ridge Resort!” Her little friend seems to agree. 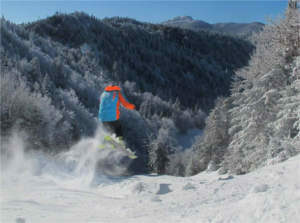 Further south, word from Stratton Mountain Resort is all about great skiing. 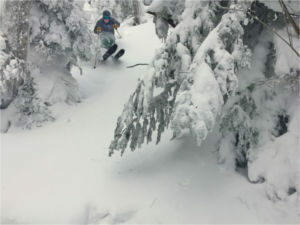 “Winter Storm Inga stopped by yesterday and left us with at least 7 fluffy inches of that fresh white stuff we all love to glide through. Today’s plan is to have 70 trails on tap, 8 of which our groomers left untouched so you can get after those leftover powder stashes. It was difficult to find a skier or rider on the mountain yesterday who could decide what his or her favorite run was because all of the trails were as one skier put it, “phenomenal.” We expect today’s prime conditions will also have people stumped on picking just one trail as a favorite. Paul from Bromley Mountain in nearby Peru agrees, “All said and done, Winter Storm Inga dropped about 6 inches of fresh snow on us. Just what we needed after last week’s thaw! 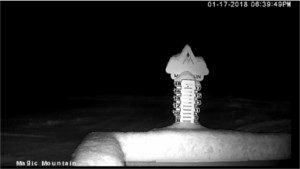 And today’s forecast is calling for partly sunny skies, temps reaching the mid 20s at the base and high teens at the summit, and moderate NW winds of up to 30 mphs. Once again, those of us who prefer sitting by a fire with a hot drink can enjoy the scenery outside. 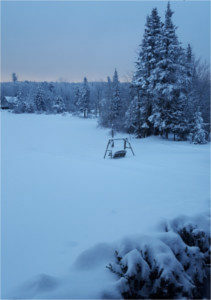 This latest blanket of white has created a magical winter wonderland. Have a look at the view from my window in Woodford. This entry was posted in Activities, Now Trending, Play, Things To Do, Uncategorized, Winter News on January 18, 2018 by Linda Warner. Week 5 – The Holiday Week Snow Report Week 11 – Snow, snow and more snow! 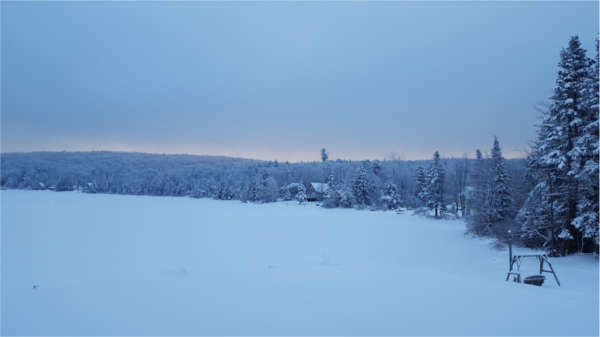 Week 6 – Into the Deep Freeze and Fresh Snow Week 4 Snow Report – It’s Now Officially Winter!